Most parents know that reading aloud to a child is a great way to help them develop literacy skills – but did you know that adults can reap the benefits of reading aloud, too? Yesterday was World Read Aloud Day, and readers of all ages across the world took time to participate. Held every year on the first Wednesday of March, this annual event for readers celebrates literacy and the power of the spoken and written word – and it’s a good time to take a look at how reading aloud can make a difference. The benefits of reading aloud start with improved reading comprehension. Have you ever found yourself reading the latest bestselling thriller, only to look down at the page and realize you haven’t been paying attention and can’t remember a thing you read? Reading aloud requires all of your focus – allowing what you read to penetrate not only your eyes but also your ears. Not only will it reinforce the material you’re reading, but you’ll be less likely to become distracted, and you’ll engage your imagination in a whole new way. If you’re writing your own crime fiction novel, reading aloud is a great way to refine your dialogue, identify grammar problems, and even strengthen your characterization. By speaking the words you’ve written, you’ll get a different perspective as your characters and story come to life. You’ll hear when something sounds stilted or rings untrue, and you may even overcome a story hurdle when you hear your ideas spoken. Another of the benefits of reading aloud includes breathing new life into your favorite suspense novel or thriller. Even if you’ve read your favorite Lou Mason mystery a half dozen times, reading it aloud might help you look at it with fresh eyes. Acting out the conversations between Lou and his best friend “Blues” might make their friendship feel more authentic – and speaking the story might reveal buried clues in the story that you’ve never noticed or considered. 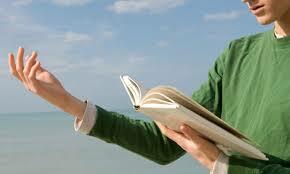 You might even find that reading aloud breathes new life into your reading habit itself. If you’ve been reading for work or for school, it’s easy to forget that can be fun – but reading aloud is a great reminder. Whether it’s a magazine article about your favorite chef or a bestselling thriller you’ve been dying to read, reading it aloud can make it feel like an entirely different activity – and make you feel more connected to the material. Think about the difference between hearing a great song on the radio and singing along with that same great song. Reading aloud makes you part of the fun instead of just an observer of the fun. While reading out loud isn’t always practical, the benefits definitely make it a worthwhile habit to practice on occasion. Try it for yourself: Read your favorite book aloud for your spouse, your child, or even yourself, and experience it in a whole new way!